Kenneth Paul Bogart was born on October 6, 1943 in Cincinnati, OH. He graduated from Marietta College in Ohio in 1965, and earned his Ph.D. in mathematics from the California Institute of Technology in 1968. He married Ruth Tucker in 1966, and they moved to Hanover in 1968 where Ken was appointed an Assistant Professor of Mathematics. Ken remained in the job that he loved for 37 years being promoted to Associate Professor in 1974, and to Full Professor in 1980. Ken's career was characterized by a love of mathematics and scholarship, and a passion for teaching and mentoring at all levels within the mathematics curriculum. His passion for research is evidenced by over 60 journal articles and nine textbooks in his field of combinatorics. Ken's research covered a wide spectrum of topics within combinatorics. This diversity arose not only from his broad interests but also from his dedication to students and to junior colleagues; he never hesitated to adapt his own research program so that he could collaborate with, and thereby most effectively guide, his many students and postdocs in areas that best suited their talents, interests, and backgrounds. Almost half of his more than two dozen collaborators were his Ph.D. students and some of these collaborations continued well after the students had established their independent research careers. This reflected Ken's enduring interest in every student. Both during their years at Dartmouth and as they progressed in their careers, all of his students knew that they could count on Ken as a valuable and generous source of encouragement, insight, and sound advice. Ken's mathematical roots were in algebra and lattice theory, and his earliest papers developed structural results for Noether lattices. One of the main topics in his research was partial orders, about which he wrote more than two dozen papers. This line of research started in the early 1970's with contributions to the theory of dimension for partial orders. A number of his papers treated applications of partial orders to the social sciences; for instance, he contributed to social choice theory by examining the optimal way to develop a consensus based on rankings that are partial orders. Interval orders and interval graphs played the most prominent role in Ken's research; his papers in this field span roughly thirty years, starting in the mid 1970's, and about half of his Ph.D. students worked in this area. Among his contributions in this area are the introduction and investigation of new concepts related to interval orders and graphs, the development of new and simpler proofs of key results, and the exploration of a number of structures that are natural variations or interesting special types of interval orders and graphs. Ken also contributed to the theory of error-correcting codes; in particular, he constructed a class of codes from partial orders. He collaborated on several papers in matroid theory, to which he contributed valuable insights from lattice theory and geometry. Of course, Ken's impact extends far beyond the content of his research papers. He was an inspiring model for balancing and excelling at the many roles that academics play, as teachers, mentors, researchers, and administrators, and he tremendously enriched the lives of those who had the good fortune to know, collaborate with, and learn from him. Ken's deep commitment to and involvement with undergraduates spanned many decades. Throughout the 1990s, he had a broad involvement in the Women in Science Program (WISP). He had been a sponsor/mentor to WISP interns in the First Year Research Internship for 5 years between 1991 and 1999. Almost all of them went on to major in mathematics: Jennifer Collins (COSC), Kristen King (MATH), Tara Holm (MATH), Lisa Prunty (MATH), Minodora Vancea (ECON), and Robin DeGracia (MATH). In addition, Ken was a regular participant in WISP's University Seminar Series on Science Teaching. This was the twice a term dinner/discussion series that brought interested faculty and administrators together to discuss pedagogy and other science teaching issues. Ken also participated in the 1995 Summer Institute for Science Teaching (the SIST institutes plus the seminar series were supported through WISP's Alfred P. Sloan grant.) The institute was entitled, "Math Across the Curriculum: Where do we go from here?" Another extremely important contribution and that was Ken's involvement on the WISP Faculty Advisory Committee from about 1998 through 2001. Throughout the later part of his career, Ken became increasing interested in how students learn mathematics. His NSF-sponsored project of "guided-discovery" in combinatorics is an element that lives on in the math department. Ken also devoted a great deal of time to helping revise the teaching seminar which is fundamental part of the mathematics graduate program at Dartmouth. 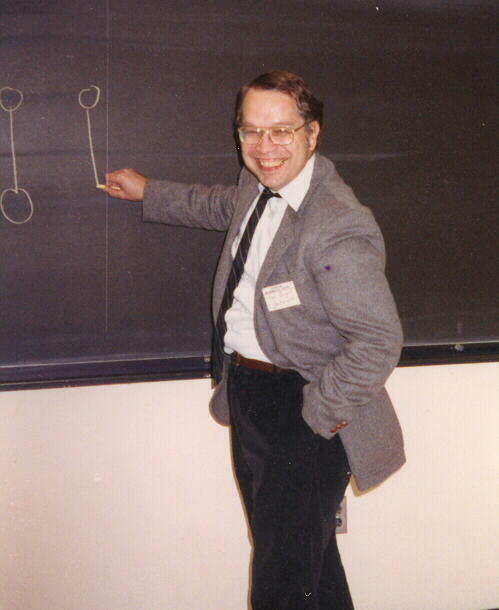 Ken chaired the mathematics department from 1989 to 1995, leading an effort for a new building for mathematics. While those particular plans never came to fruition, he was once again deeply involved in the Kemeny Hall project which will be the new home of the Mathematics Department starting in the fall of 2006. And Ken's mentoring extended beyond his students. As a new chair of the department, it was always nice to get feedback and perspective from another who had walked the path before me. His insights were always detailed and appreciated. For the past nine years, Ken and Ruth spent winters in Santa Rosa, CA, where they loved to hike and mountain bike. I have borrowed freely from a number of published sources (below), and am especially grateful to Professor Joe Bonin for writing about Ken's research, Mary Pavone for her remarks about Ken's involvement with WISP, and for a photo from Ruth Bogart.